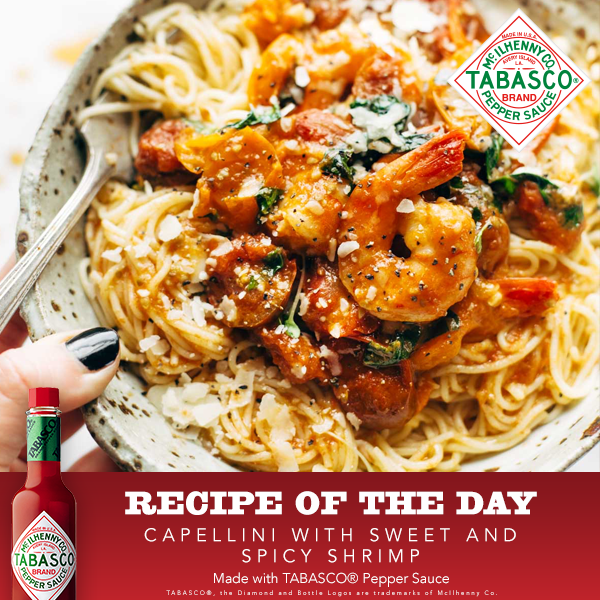 Give your tastebuds a treat with this unique twist to the Capellini! 1. In a large pot of boiling water, prepare pasta according to package directions. Drain well. 2. Meanwhile, melt butter in a large skillet, over medium heat. 3. Cook onion and garlic 5 minutes or until translucent, stirring occasionally. 4. Add shrimp and sauté 3 minutes, until shrimp are done. Remove and set aside. 5. Add chicken broth, sun-dried cherries, lemon juice, brandy, TABASCO® Sauce and salt. Bring to a boil over high heat. 6. Reduce heat to low and simmer 2 minutes to blend flavors. 7. Stir in 1 cup fresh basil, 4 oz. Parmesan cheese and reserved shrimp. 8. Place pasta on a platter, top with shrimp mixture. 9. Sprinkle with remaining basil strips and Parmesan. Serve garnished with basil sprigs and whole cherries, if desired.